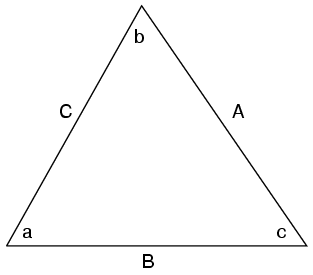 A right triangle is defined as having one angle precisely equal to 90o (a right angle). H is the Hypotenuse, always being opposite the right angle. 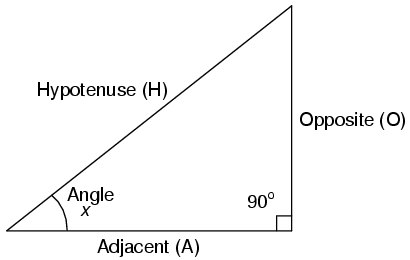 Relative to angle x, O is the Opposite and A is the Adjacent. "Arc" functions such as "arcsin", "arccos", and "arctan" are the complements of normal trigonometric functions. 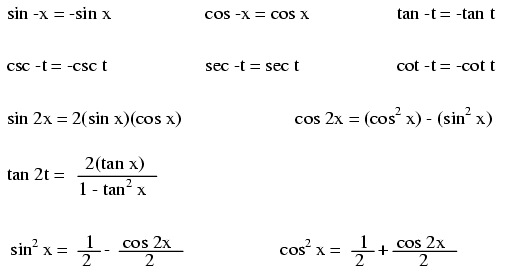 These functions return an angle for a ratio input. For example, if the tangent of 45o is equal to 1, then the "arctangent" (arctan) of 1 is 45o. "Arc" functions are useful for finding angles in a right triangle if the side lengths are known. 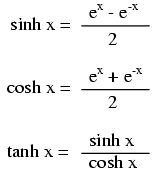 Note: all angles (x) must be expressed in units of radians for these hyperbolic functions. There are 2π radians in a circle (360o).